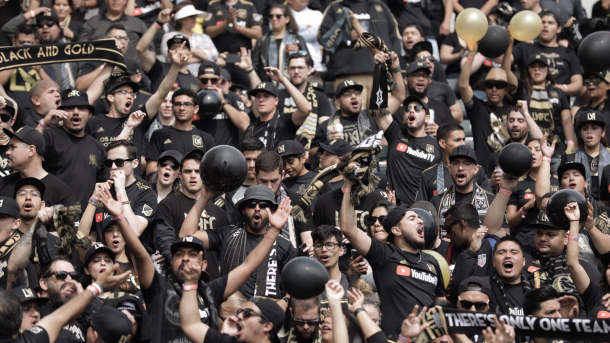 LOS ANGELES - The historical rivalry of Los Angeles Football Club (LAFC) and the Los Angeles Galaxy that waxed eternal over the last six months finally boiled over into a frenzy of aggressive faux-hooliganism as LAFC fans attempted to finally put their imprint on the age-old rivalry by smashing a cooler, stealing scarves and generally being dicks to Galaxy fans. "THIS IS OUR TIME," stated LAFC fan Sam Howelston as he ceremoniously burnt a LA Galaxy scarf that he bought the week before from Amazon. "WE CONTROL THE CITY, AS WE HAVE SINCE THE START OF THIS RIVALRY SIX MONTHS AGO." The Nutmeg News sent a reporter to speak to rivalry historian Dr. James Frank Odderbody at the University of South-East California. "The origin of the rivalry is MANY days old. It is lost to history, but the roots are deep within the area. What you see is a class divide as LAFC is seen as the working class club owned by billionaires and the Galaxy are seen as the elite club also owned by billionaires. It's an age-old conflict of class values. The super rich versus the super rich, an american tradition. What we have here is the proxy conflict exacerbated by the clear dominance of AIG in the inflated ticket market." We spoke to Galaxy fan Sean Driscoll who stated, "They were everywhere, suddenly. I thought I was going to drop my beer. They kept saying, 'welcome to LA,' but I actually live 10 minutes from here so I don't know what the hell they are talking about." The Nutmeg News will have more on this as this historical rivalry is compared to the eternal derby of NYCFC versus RBNY.